It is my dream to provide beautiful portraits for our elderly with a focus on those suffering with Dementia. I'm a nurse practitioner, and I specialized in the care of those with Dementia and related diseases. I couldn't help but notice the paucity of portraits capturing the personality and beauty of the people I care so much for. Just See Me- Sacred Stories from the Other side of Dementia is a project/book about families living with Dementia. It's a culmination of 13 stories of families and the love that they have for one another. Their stories range from when they first learned that they or their loved one had the disease to how they manage day to day. Very interesting themes have emerged! Just See Me- Sacred Stories from the Other side of Dementia is a book about the love in families and people with dementia. After years of being in reverence of families caring for loved ones with dementia, I realized these stories of LOVE and DEVOTION need to be shared with the world. These are the stories so rarely heard. Just See Me is about the many expressions of love and will certainly entertain, inspire and open your heart. 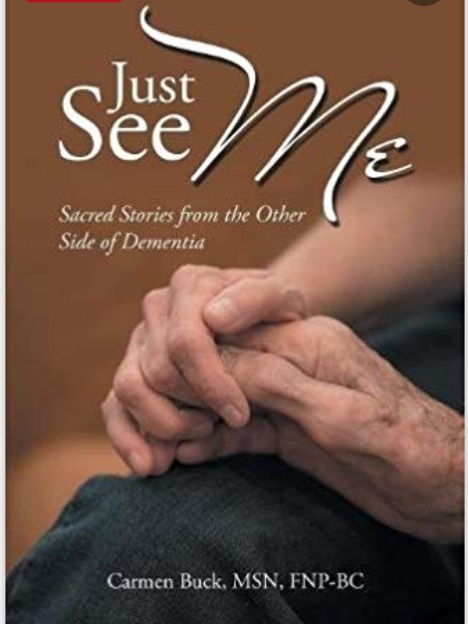 You will see dementia and family caregiving through the eyes of compassion and love as you read “Just See Me-Sacred Stories from the Other Side of Dementia”. You’ll read true stories of courage, strength, sorrow, grief, transcendence, loyalty, success, faith and hope. The stories are moving and real and yet we all know this is the beginning of a bigger conversation as more and more of us become caregivers to those we love. In “Just See Me-Sacred Stories from the Other Side of Dementia”, family caregivers teach us extraordinary lessons which not only show us how to be better caregivers, but also better human beings. Subscribe to Newsletter and Stay UP to DATE! We respect your privacy and will not share your information. You will receive notifications when newsletters are published.